Mfr Description: Good-looking 1980s import meets cruiser’s need for comfortable accommodations, versatile layout, economical operation. Offered with several two- and three-stateroom interiors over the years, all with quality teak cabinets, generous storage, tasteful furnishings. Highlights include roomy salon with standard lower helm, spacious fore and aft staterooms, two full heads. Wide side decks are a plus. Radar arch, hardtop, bow pulpit, swim platform were standard. Cummins 270hp diesels cruise at 16 knots (18–20 knots top). 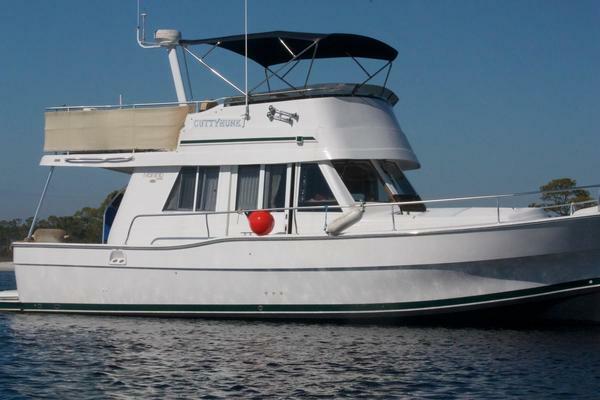 West Florida Yachts would love to guide you through a personal showing of this 46' Overseas PT 46 Sundeck 1986. This yacht for sale is located in Slidell, Louisiana and priced at $99,000. For a showing please contact us by filling out the form on this page and we will get back to you shortly!